870111 Features: -Tool tote carrier.-High visibility safety reflective tape trim.-Exterior spirit level and blueprint holder straps.-Durable water-resistant 600 denier polyester.-Sturdy metal handle with padded handhold.-Loop tool holders, electrical tape roll holder and metal tape measure clip.-Open main storage compartment with 13 interior / exterior storage pockets. 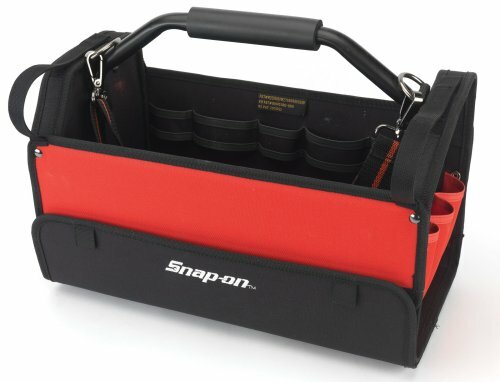 Includes: -Includes a 12 compartment small parts organizer. Dimensions: -Overall dimensions: 16.5'' x 8.5'' x 10.25''.-Dimensions: 10.25'' H x 16.5'' W x 8.5'' D. Warranty: -Lifetime limited warranty.